If you’ve paid a visit to Mullinax Ford of Olympia, you will undoubtedly have noticed the popularity of the latest 2017 Ford Escape. The Ford Escape spares no effort or expense at being one of the brands most exceptional SUV models yet. The 2017 Ford Escape enters the market at a reasonable price, considering the features and benefits it has to offer. 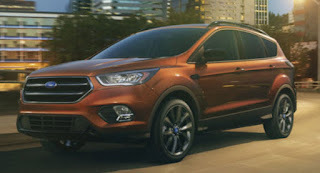 Ford has certainly stepped up its game in terms of advanced tech and gadgets included in the new Escape and the new EcoBoost engine has also become the talk of the town. The turbocharged 1.5-liter (standard in the SE model) engine packs a punch with 180 horsepower and 185 lb-ft of torque. Ford offers its drivers options though. There’s also a 2.0 liter EcoBoost and which offers 245 horsepower and 275 lb-ft torque as well as a 2.5 liter 4-cylinder option. All engine options come with a 6-speed automatic transmission. What’s great about the 2017 Ford Escape’s design is that it effortlessly combines space and utility with easy off-road handling and comfortable elevated seating. It’s the perfect formula for a modern compact crossover SUV. Ford Sync Connect – this technology allows owners to control various vehicle features via their smartphone, remotely start and lock/unlock the vehicle, schedule starting times, check fuel levels remotely, check up on upcoming service requirements, locate the vehicle at any time and more. If you’re worried about what this means for security, don’t be! There’s a 2-step authorization process required in order to carry out these functions. Auto stop-start function – this helps fuel economy by saving around 6% in regular start and stop type traffic. Adaptive cruise control with forward-collision warning. Lane-assist alert and active lane aid which can help with steering corrections. Parking assist functions where driver has pedal and gearshift control while the system controls precise, safe steering. In addition to these new technologies, the Ford Escape this year sees some of its old technology make a re-appearance. These include auto high beams, blind spot monitor, hill-start assistant, and vaunted foot-activated tailgate. In terms of fuel economy, Ford’s new SUV doesn’t disappoint. It offers a 21 city MPG rating and a 29 highway MPG rating. Other features you’ll probably love include the electric power steering, rearview camera, turn-by-turn destination guidance, destination download, tilt and telescopic steering wheel and plenty interior storage. Want to experience the true handling capacity and comfort of the 2017 Ford Escape? Why not book a test drive at Mullinax Ford of Olympia! At Olympia Auto Mall, we stock both new and used cars for sale. If you’re looking to invest in the 2017 Ford Escape, rest assured that we have a variety of models for you to choose from. Our professional team will be able to assist you with arranging a test drive and acquiring vehicle finance, if required. For more information and advice on our range, contact us at Olympia Auto Mall today.